Ombudsman Republik Indonesia - ORI is the Ombudsman of the Republic of Indonesia. 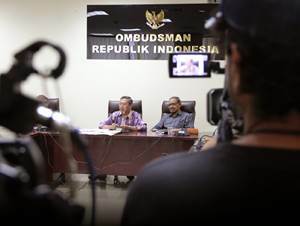 Ombudsman Republik Indonesia is a non ministerial state-agency in Indonesia which was formed by the Government of Indonesia to supervises public service institutions in Indonesia. Ombudsman Republik Indonesia was first established in 2000 as Komisi Ombudsman Nasional or the National Ombudsman Commission of Indonesia. The name of Ombudsman Republik Indonesia officially established in 2008 nased on Law No 37 of 2008 on the Ombudsman of the Republic of Indonesia. The state-agency is headquartered in Jakarta and now has 33 representative offices spread across Indonesia. According to Ombudsman's profile as cited by JobsCDC.com, Ombudsman Republik Indonesia now has 9 board members, including 1 chairman and 1 vice-chairman. The members of Ombudsman are nominated by the President of Indonesia and appointed by the House of Representatives (DPR) based on the candidates which nominated by the President of Republic Indonesia. Central Java Province (Code : KP JATENG) - 1 position available. North Kalimantan Province (Code : KP KALTARA) - 1 position available. Maluku Province (Code : KP MALUKU) - 1 position available. Competent, honest, have moral integrity, have the capability and have a good reputation. Minimum age of 40 years and the maximum age of 60 years as of 9 November 2016. Minimum Bachelor degree (S1) in Law or other equivalent majors that have the expertise and experience of at least 7 years in the field of law or rule relating to public service. Have knowledge of the Ombudsman and the public service. Not been sentenced by a court decision that has acquired the force of law for committing a criminal offense punishable by imprisonment of 5 years or more. Willing to not concurrently be a State Officials or State Administrators in accordance with the provisions of laws and regulations, management or employees of BUMN/BUMD, political parties boards and / or members and other professions (such as doctors, accountants, notaries, land PPAT). Active and have a wide networking with government, community organizations, NGOs, the media and universities in each area office of the ombudsman. Aceh Province (Code : CA ACEH) - 6 positions available. North Sumatera Province (Code : CA SUMUT) - 7 positions available. Riau Province (Code : CA RIAU) - 5 positions available. Riau Islands Province (Code : CA KEPRI) - 3 positions available. West Sumatera Province (Code : CA SUMBAR) - 6 positions available. Jambi Province (Code : CA JAMBI) - 5 positions available. South Sumatera Province (Code : CA SUMSEL) - 2 positions available. Bengkulu Province (Code : CA BENGKULU) - 5 positions available. Lampung Province (Code : CA LAMPUNG) - 5 positions available. Bangka Belitung Province (Code : CA BABEL) - 2 positions available. Banten Province (Code : CA BANTEN) - 2 positions available. West Java Province (Code : CA JABAR) - 3 positions available. Central Java Province (Code : CA JATENG) - 4 positions available. D.I Yogyakarta Province (Code : CA DIY) - 2 positions available. East Java Province (Code : CA JATIM) - 7 positions available. Bali Province (Code : CA BALI) - 5 positions available. West Nusa Tenggara Province (Code : CA NTB) - 4 positions available. Wast Nusa Tenggara Province (Code : CA NTT) - 7 positions available. West Kalimantan Province (Code : CA KALBAR) - 5 positions available. Central Kalimantan Province (Code : CA KALTENG) - 5 positions available. East Kalimantan Province (Code : CA KALTIM) - 6 positions available. North Kalimantan Province (Code : CA KALTARA) - 4 positions available. South Kalimantan Province (Code : CA KALSEL) - 4 positions available. South Sulawesi Province (Code : CA SULSEL) - 5 positions available. South East Sulawesi Province (Code : CA SULTRA) - 6 positions available. Central Sulawesi Province (Code : CA SULTENG) - 6 positions available. West Sulawesi Province (Code : CA SULBAR) - 5 positions available. North Sulawesi Province (Code : CA SULUT) - 6 positions available. Gorontalo Province (Code : CA GORONTALO) - 3 positions available. Maluku Province (Code : CA MALUKU) - 4 positions available. North Maluku Province (Code : CA MALUT) - 6 positions available. Papua Province (Code : CA PAPUA) - 5 positions available. West Papua Province (Code : CA PABAR) - 5 positions available. DKI Jakarta Province / Head Office (Code : CA PUSAT) - 53 positions available. Minimum age of 22 years and the maximum age of 35 years as of 9 November 2016. Minimum Bachelor degree (S1) with the minimum GPA of 2.75 (university with minimum accredited A) or minimum GPA of 3.00 (other university), preferably majoring in Laws, Social and Political Science, Public Administration, Statistics, Accounting, Psychology, and other related majors.. Willing to not concurrently be a Civil Servants (CPNS), political parties boards and / or members, advocate/lawyer and other professions (such as doctors, accountants, notaries, land PPAT). Preferably for candidates who active and have a wide networking with government, community organizations, NGOs, the media and universities in each area office of the ombudsman. JobsCDC.com now available on android device. Download now on Google Play here. Please be aware of recruitment fraud. The entire stage of this selection process is free of charge. Ombudsman Republik Indonesia - Assistant, Head Non CPNS Ombudsman November 2016 will never ask for fees or upfront payments for any purposes during the recruitment process such as transportation and accommodation.